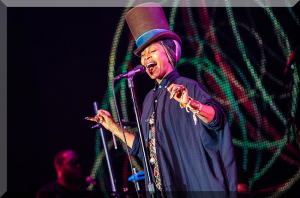 CENTRIC today announced that the SOUL TRAIN AWARDS 2015 will be hosted by the incomparable singer-songwriter Erykah Badu. The hippest trip led by the illest chick will celebrate soul music’s R&B legends alongside the next wave of talented artists. Filmed November 6 at the Orleans Arena in Las Vegas, the SOUL TRAIN AWARDS will air on CENTRIC and BET on November 29th, 2015 at 8PM ET. Musical luminaries being honored at the show include Kenny “Babyface” Edmonds, who will receive the Legend Award and Jill Scott who will accept the first-ever Lady of Soul Award. These icons are being recognized for their longstanding presence in the industry and influence on the world of music past and present. R&B legend and record producer Kenny “Babyface” Edmonds has won 11 Grammy Awards and written and produced 26 No. 1 R&B hits. His new album, Return of the Tender Lover, will be released December 4th. A torchbearer of R&B music, Jill is a 3x Grammy Award-winner who has also established herself as a critically acclaimed actress as well as a New York Times bestselling poet. The SOUL TRAIN AWARDS will feature an exciting lineup of unforgettable performances and viewers can expect special appearances by some of the brightest stars in entertainment. The event annually showcases Soul Train’s influence on the history of music and dance from the 70s to today. Another fun addition for visitors to look forward to is the full SOUL TRAIN WEEKEND November 5th-7th. Packages are on sale now on Ticketmaster.com, starting at $800. Individual tickets can be purchased for the Centric Presents Soul Train Awards at Orleans Arena (orleansarena.com) and the Soul Train Weekend Concert featuring R. Kelly with special guest Kenny “Babyface” Edmonds (Ticketmaster.com). General admission tickets to the Soul Train Weekend Late Night Party at LIGHT nightclub will be available at a later date to be announced. Additional information and ticketing can be found at SoulTrainWeekend.com. The SOUL TRAIN AWARDS 2015 is produced by Jesse Collins Entertainment. Executive Producers of the network telecast are as follows: Debra Lee, Stephen Hill, Connie Orlando and Lynne Harris Taylor from BET; and Jesse Collins from Jesse Collins Entertainment. Erykah Badu is an Associate Producer.